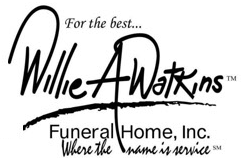 Welcome to Willie A. Watkins Funeral Home, Inc.
From as far back as he can remember Willie Watkins’ life has been immersed in end of life rituals. He has, in fact, been a lifelong student of mortality. Frequenting funerals as a young boy in rural Georgia, later becoming a licensed funeral director and embalmer, and ultimately proprietor of Atlanta’s busiest mortuary, Watkins has likely spent as much time in the presence of the deceased as he has among the living. He is equally comfortable in either realm, celebrating both life and death with a trademark style, equanimity and sincerity. There’s not much difference in the little boy growing up in Scottdale, Georgia under the doting and watchful eye of his grandmother, and the man who is a mortuary mogul today. Born with a personality as big as his heart, Watkins has always cared about making people happy, always worked hard to excel, and always exhibited an impeccable flair for fashion. 1003 Ralph D. Abernathy Blvd.